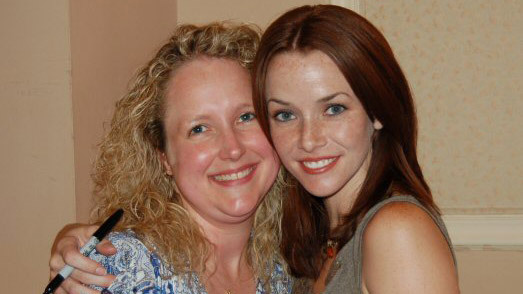 General Hospital fan Stacey Lopez spoke with Annie Wersching at the 2007 GH fanclub luncheon event and was kind enough to send us her footage of their brief chat. Stacey: We’re here with Annie. Welcome to General Hospital! She plays Amelia. Stacey: And you kinda come in and cause a little bit of trouble. Annie Wersching: Little bit, little bit. I like to stir it up. Stacey: And you’re working with Maurice Bernard. Stacey: So what was the auditioning process like? 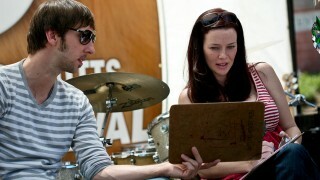 Annie Wersching: Um, I didn’t audition actually for this [role]. I had tested for two parts in this prior. One was like four years ago and one was like two and a half years ago or so. And so when this came up it was going to be just recurring for like two months, so they just asked me if I wanted to do it. And Mark Teschner [General Hospital casting director] was great, love him. And yeah, I’m sticking around for a while. Stacey: So what trouble could we look forward to Amelia creating next? Annie Wersching: Ooh, I don’t know. Right now she’s dealing with whether or not to tell the world that Sam saw the baby being kidnapped. And we’ll just have to see from there. Stacey: I’m thinking she’s going to be telling. Annie Wersching: I’m thinking yeah, but you know, she needs to keep that so she has something to hold over her, you know? So..
Stacey: Well welcome to the show. Annie Wersching: Thank you, thank you so much!